Autumn Anxiety? Casa Victoria is Here to Catch Your Fall. Bring on the sweaters and hot toddies! In all seriousness, we have some great vintage pieces that have just arrived in our store. Not only will the following pieces help you transition your home decor from Summer to Autumn but they are pieces that have a timeless beauty to them no matter the weather. Redecorating can sometimes be so exhausting that you can barely stand on your own two feet. Let Casa Victoria catch your fall as you fall into Fall. Once your guests see this marvelous midcentury masterpiece in your home, they will be green with envy. Who needs friends when you have objects to keep you company? 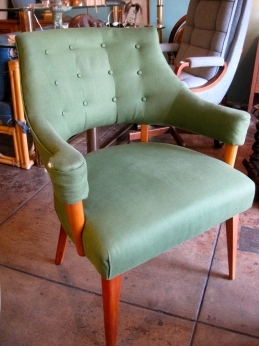 This mid-century chair is upholstered with its original green linen. The chair sits on a mahogany base, has a buttoned back and darling dowel legs. This pair of Italian candle sticks are the perfect accents for your darling Spanish casita nestled in the rolling hills of Silver Lake. 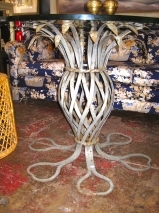 Situate one on either side of your rustic fireplace. 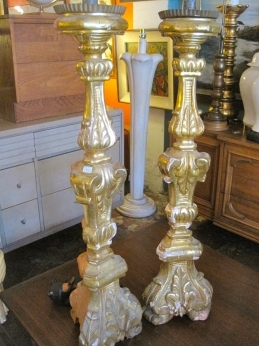 The pair of gilded, hand carved wooden candle sticks have a weathered charm to them. Don't you think? This 1980s floral couch would make Nancy Reagan's heart jump for joy. The timeless shape and size of this sofa is perfectly scaled. The upholstered legs and slightly rolled arms contribute to the elegant design. Just because you live in a studio apartment doesn't mean you can't have dinner parties. This mid-century server has a cane-wrapped sliding door and the original black finish. There is an adjustable shelf and a cork lined silverware drawer inside the cabinet. With this adorable table in your home, no guest will ever feel unwelcome in your abode. This iron pineapple breakfast table has a glass top and a warm disposition.